I am writing this addition in 2004 because I realize in re-reading my original email that I was unusually hard on Punta Arenas. It's not a bad town, actually. Punta Arenas has some nice turn of the century architecture. It used to be a big deal, sitting on the tip of South America on the Mageallan straight, as it does, with lots of ships passing through as they made their way around Cape Horn. Then the Panama Canal was opened, and things dried up for the prosporous town. It still was (and is) an important industrial port for Chile, and has come back in recent years thanks to tourism and especially the cruise ship industry. The real reason that I need to revise my Punta Arenas story, though, is that it holds one of my most important memories of my trip. There is one moment that really shines through whenever I think of travelling, and that was early morning in Punta Arenas, Chile. I walked out from my hotel to a bright sunny day (of which they had been few in Patagonia since I had gotten there). I was suddenly struck by how happy I was. I was in a place as far as I had ever been from home. Everything was at the same time both so familiar and so alien. Everything that was worrying me back home was completely and totally off my shoulders. I was totally free to not worry about anything except walking around and checking out the town. It was a moment of complete and total freedom. And the sun was shining. 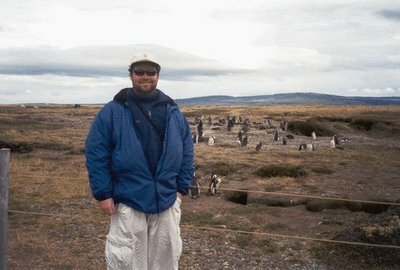 Whenever I am feeling low, I think back to that moment in Punta Arenas, and it always makes me smile. So Punta Arenas is not Sudbury on a bad day. It's the place that represents freedom to me. And that makes it one of the greatest places in the world.